CSS 3 is the modularization of Cascading Style Sheets to let additions to the specification. It boasts some outstanding features that have revolutionized Web layout and design. Although it has many advantages, but that doesn’t mean it doesn’t have any disadvantages — and taking care of those disadvantages need you to be really smart. CSS3 is new, so there is still a lot to ameliorate. One of the biggest problem is that the properties are browser-specific, which means that it is not easy to implement them across browsers. Developers are required to add extra code to implement the properties the same way across browsers. 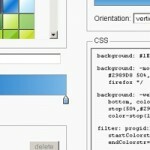 But you need not worry as many tools are available out there that let you generate CSS3 to assist you. The best part is that these tools allow for full customization, and that means anyone can use them easily.